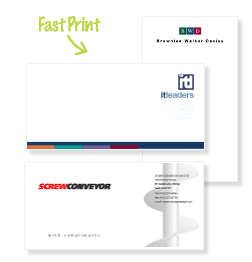 Full colour digitally printed colour compliment slips printed single sided using a choice of white or cream 100gsm paper. The process rivals traditional litho, but is a much quicker turnaround for urgent jobs. How do I pay for Digital compliment slips? Do I need artwork for Digital compliment slips? You can look at litho compliment slips to compare prices. Printline Advertising is a compliment slip printer in Leeds. We have been printing compliment slips in Leeds since 1999.